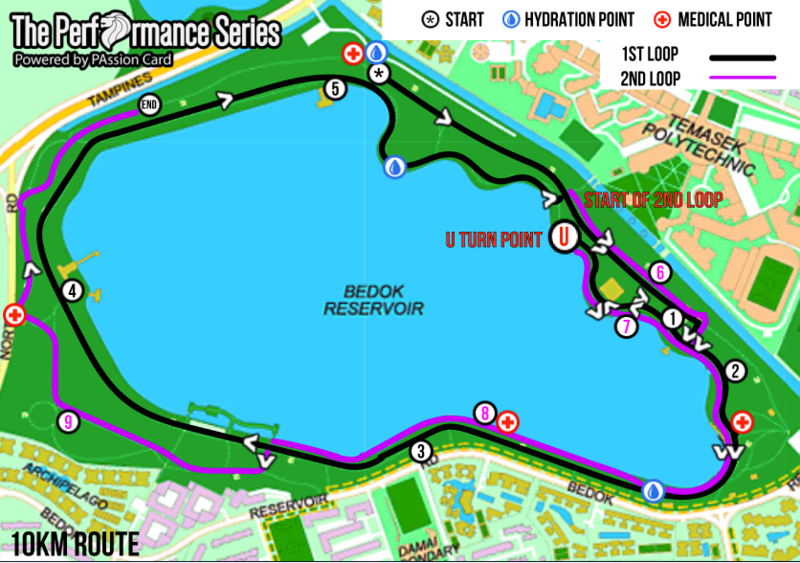 Race Review: The Performance Series 2016, Race 4, Bedok Reservoir [10 KM] (by Jillian) | JustRunLah! This is the 4th of the 5 races in The Performance Series and is located at Bedok reservoir. It was a rainy morning on the day of the race and from what I saw on the official race Facebook page, the 1st wave for 10 km was cancelled due to lightning alert. As I was in the 3rd wave, I was not affected by the cancellation, although the 3rd wave was flagged off together with the 2nd wave with was delayed. It was a little crowded but it was generally alright as the paths were relatively wide and spacious throughout. As stated in the email, runners who go by car were to alight at Carpark A. To my surprise, it was a rather long walk (10-15 mins) to the starting point. It was a mistake (typo) on the email and I only realized it after scrolling through their Facebook posts. The nearer carpark should have been Carpark B. But since I’ve already walked the distance and reached the starting point on time, I’ll just treat it as a warm up before the race! We made about 1.5 rounds around the reservoir and towards the end, there was a really steep slope. And I meant it when I said REALLY steep. I tried jogging my way up slope but ended up walking instead (oops!). My legs were just too tired to handle the slope then. The hydration points in this race were sufficient in my opinion and the volunteers worked really fast to keep up with the high water demand of the runners. At the end of the race, the issuing of finisher tees and medals were also fast and efficient with no need for queuing. There is however one little issue with the mud. The field was rather muddy at the collection point (for my queue) and my heart broke a little as I stepped my shoe into the mud on the way to collect the medal. CRY. Although my shoe got a little muddy in the end, I was still feeling really happy as I held my finisher medal 🙂 This race was definitely a good one and am really looking forward to the last race of this series so as to complete my medal collection!